Pausing, unpausing and seeking are synchronized over the Internet, giving everyone playing the same file in the same virtual room a shared viewing experience. Use alongside VoIP software, e.g. Mumble or Skype. “3..2..1.. Play! …No wait, pause! …No wait, argh!” — What people had to shout before Syncplay. 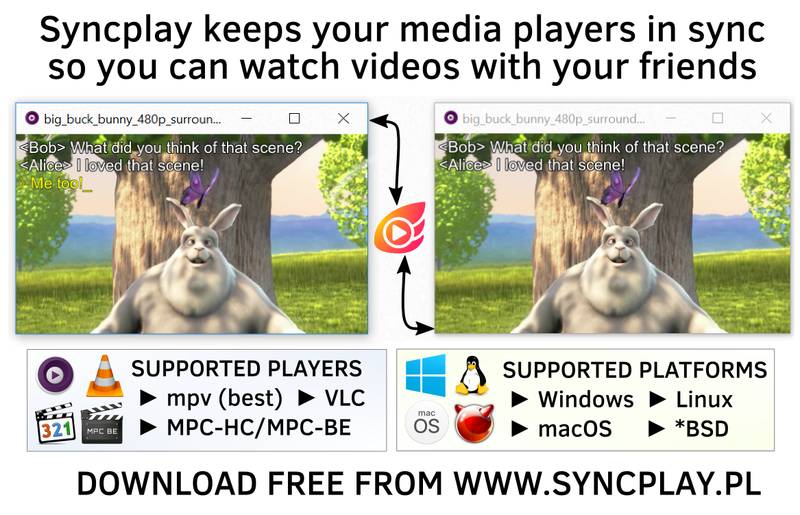 For best compatibility use Syncplay with mpv media player. You can report Syncplay bugs through https://github.com/Syncplay/syncplay/issues. You can chat with us through IRC via #syncplay on chat.freenode.net when we’re around. Note: You will need to register your account with nickserv to speak! …But first check out the Support section to see if the problem can be resolved.